Boost the elegance of your home with a floor that is strong and beautiful. 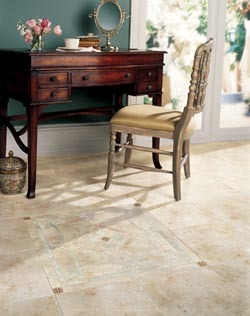 Bob Wagner’s Flooring America has the porcelain and ceramic tile flooring in Downingtown you seek. Downingtown tile flooring is a versatile surface, as it can be used in virtually any room of your home. Consider tile for your kitchen and bathrooms, as it resists water that damages the integrity of other floors. For instance, water stains and warps hardwood floors and laminate is not strong enough to withstand heavy amounts of moisture without peeling. Water droplets sit atop of tile’s surface, making it impossible to absorb. When you invest in flooring, you want it to last. We offer you nothing but quality products, including reputable Daltile® floors in Downingtown. Buying floors from leading manufacturers means you always receive dependable flooring that lasts as long as it should. Here at Flooring America, we take our commitment to quality seriously and maintain our reputation as your source for name brand floors you can trust. Our certified installers are highly knowledgeable, experienced, and dedicated to delivering excellent results in your home. Whether you own a modest home or a mansion, our team works hard to exceed your expectations. Let us bring your interior design plans to reality with top-notch installation. Request a free in-home measurement by completing our online Contact form or calling us at <PHONE>. Find a handsome variety of tile flooring in Downingtown from our renowned flooring store. We proudly serve clients in Downingtown, Coatesville, Honey Brook, Chester Springs, Lionville, and Exton, PA.
We're proud to serve customers throughout Downingtown, Coatesville, Honey Brook, Chester Springs, Lionville, and Exton, PA.